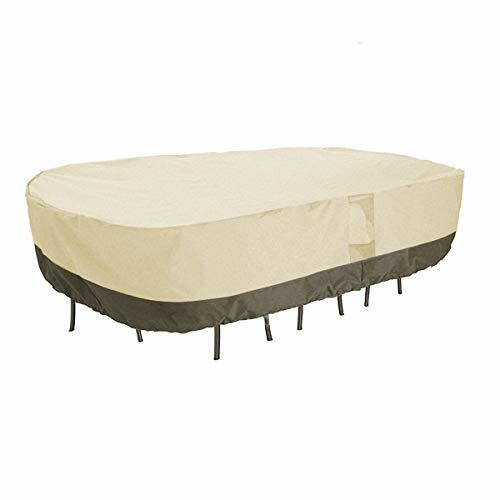 PHI VILLA patio lounge covers offer supreme protection for your outdoor furniture against rain, snow and other outdoor elements. 600d Oxford fabric undercoated with PVC is heat resistant, mildew proof and flame-retardant. Adjustable hems and click-close straps at the bottom ensure adjustments of tightness for a custom fit and keep the cover from blowing off on windy days. Air vents promise good air circulation and no moisture on your furniture. Your furniture and you will be both satisfied with our well made covers. PHI VILLA is a designer's brand and manufacturer which indicates to provide high quality leisure garden furniture in order to meet the continuously expanding market. PHI VILLA produces a specific range of garden furniture which includes chair, patio umbrella, furniture set etc. High quality and fashionable design is PHI VILLA's first goal. Customer's satisfaction is PHI VILLA's first demand. By using special chosen design and color. PHI VILLA product will provide you with gorgeous beauty of imagination and efforts. If you have any questions about this product by PHI VILLA, contact us by completing and submitting the form below. If you are looking for a specif part number, please include it with your message.